January 31, 2018 - Premier Transportation was honored and humbled to receive the Green Spirit Award at the recent Annual Meeting & Marketplace of the American Bus Association (ABA). This event provides networking and educational seminars for transportation providers across the country, and the 2018 event was held January 26-30 in Charlotte, NC. Premier received this award due to its ongoing commitment to effective maintenance and efficient fuel use for all the buses and vehicles in its Dallas fleet. Premier is the largest transportation provider in North Texas, with almost 100 vehicles including motor coaches, shuttle buses, Sprinter vans, SUVs and sedans. “Premier Transportation exemplifies a contemporary standard for motorcoach operators seeking ways to improve efficiency while working to reduce waste and provide operationally clean, modern and luxurious transportation options for their customers. They are innovative in all aspects of their business from their industry setting customer service commitment to operating the latest, energy efficient and environmentally friendly equipment. We are pleased that Premier has selected the MCI J4500 coach as a key part of their modern livery”, says Patricia Ziska, Vice President of New Coach Sales for Motor Coach Industries, Inc. The ABA Green Spirit Award is sponsored by Motor Coach Industries (MCI) and recognizes motorcoach industry leaders for their investment in environmentally responsible equipment and the adoption of green business practices. The Green Spirit Award is based on three aspects of a company’s operations: administrative, maintenance, equipment and facility practices. Dallas — It was an industrywide affair when Premier Transportation held an open house November 15 to celebrate the grand opening of its new location. With upward of 30 national operators coming in from all over the country, visits from local affiliates, a number of vendors making the trip out—including representatives from Grech Motors, which sponsored the event—and scores of clients dropping by throughout the day, owner Eric Devlin estimates that 250 guests helped the Premier team celebrate their newest Texan home right in the heart of Dallas’ uptown Hospital District. Read full article by Chauffeur Driven. Premier Transportation, another leading Dallas-area limousine and bus operation, owner Eric Devlin was working on two fronts: Providing motorcoaches and coordinating charity relief efforts. Premier has been contracted by local fire departments outside of Texas for five motorcoaches to transport firefighters, EMT, and first responder personnel from DFW to the Houston area in coming weeks. The company also is storing donated supplies at its Dallas warehouse until Sept. 8 when Premier buses will take them down to the Houston area. The company is accepting any donations at its warehouse at 4525 Production Drive in Dallas, open 24 hours. (Donors after 7 p.m. need to call the number at their front door). Among items Premier is collecting: Water, Gatorade, etc., canned goods and non-perishable food items; towels, pillows, blankets, sheets, etc. ; toiletries, diapers, and medical supplies; and lightly worn clothes, shoes, etc. On April 9, the staff of the Academic Life Skills department at Hebron High School in Carrollton hosted a gala event for special needs students. This was a special Prom night held at Glen Eagles Country Club, with all the smiling students decked out in their gowns and tuxes. This Prom is just one of the many events where Premier contributes its services to benefit students, charity fundraisers, school auctions and other worthy causes throughout the metroplex. At a gala event at the recent LCT International Show in Las Vegas, Premier was honored to be selected as National Operator of the Year in the category of 51 or more vehicles. This is the third time Premier has been named Operator of the Year, also winning the award in 2009 and 2011. Transportation providers and supporting vendors from around the world gathered at the LCT Show to attend seminars and educational panels, network with their peers, browse new vehicles and other equipment, and recognize industry excellence. The 2017 Operator of the Year Awards Gala was held in the Sands Expo and Convention Center. When this innovative facility opened in 1990 across the street from the original Sands Hotel, it was the second largest convention center in the world. To be selected for the award, operators submitted a packet of information and documentation on their business practices. A panel of six independent judges scored two to four finalists in each category on a scale of 1-10 each in the following ar­eas: Customer service, technology, safe­ty/insurance, chauffeur training, media/marketing, and community/industry in­volvement. Premier was recognized as the superior entrant for 2017 in the Large Fleet category. The Las Vegas show was hosted by LCT (Limousine, Charter and Tour) Magazine, a leading transportation industry publication. LCT Magazine is also the official magazine of the National Limousine Association, a professional organization. Premier is proud to be a member of the NLA, whose members include the best transportation provides in the country. Premier Transportation wins Favorite Transportation Vendor Award! Premier Transportation is proud to be named to the Hall of Fame by the American Association of Certified Wedding Planners (AACWP), as announced at the 10th Annual Vendi Awards gala held Feb. 19 at the Fairmont Hotel in Dallas. The AACWP holds the Vendi Awards event every year to recognize favorite wedding vendors in various categories like Florists, Photographers, Ceremony Sites, Reception Venues, and several other areas. Premier received the Vendi Award for Favorite Transportation Vendor in 2011, 2012, 2013, 2015 and 2016. Vendors who receive 5 wins are then inducted into the Hall of Fame by the AACWP, and they continue to be recognized annually at each succeeding Vendi Awards event. This year’s event was held in the newly renovated ballroom of the beautiful Fairmont hotel in Downtown Dallas. Over 400 attendees were treated to gorgeous floral arrangements, gourmet food and after party entertainment, along with announcement of the Vendi Award winners for 2017. Premier’s induction into the Hall of Fame came early in the program, and Premier Wedding Specialist Laurie Johnson was honored and humbled to accept the award. Laurie has managed the wedding side of Premier’s business since joining the company in 2010. She has worked closely with wedding planners from the AACWP, as well as directly with wedding clients, to help grow Premier’s wedding business nearly 1000 percent over the last several years. Laurie’s list of affiliated wedding planners now includes over 100 highly dedicated wedding professionals, who continue to recommend Premier to all their wedding clients. Laurie has conducted classes for the AACWP on how to select and manage transportation for a wedding. Laurie has also written articles published in industry magazines, featuring tips on how to grow the wedding business for transportation providers. Founded in 1996, Premier Transportation offers a fleet of vehicles, including limousines, SUVs, vans, limo buses, shuttle buses, and coach buses. Premier Transportation can accommodate any size group, from an airport transfer for six people to a corporate event for 200 guests. The company has an A+ rating from Better Business Bureau and was named National Operator of the Year by an industry association and trade magazine. The experienced, professional staff and clean, late-model fleet provide a level of comfort and safety beyond expectation. This year at the LCT-NLA Show East, the fourth-annual People's Choice Awards packed a ballroom full of industry members waiting with baited breath to see who would take home the prestigious awards. Gold Star Award: Celebrates a Good Samaritan. The recipient has gone beyond the call of duty in the spirit of service, acts of kindness and goodwill. Mr. Devlin not only stepped up to the plate when tragedy struck Dallas, Texas, on July 7 when five officers were killed by a sniper, he donated all the transportation for the funerals, viewings and many other things as it related to getting the families there. Even when he had Chauffeurs willing to "not be paid" for the time because they were so honored to help, he insisted they be paid. DALLAS, TEXAS SEPTEMBER 7, 2016: Twenty-three-year-old Katy Golden and her fiancée live less than a mile from the center of downtown Dallas. On the night of July 7, the sales and marketing coordinator for Premier Transportation never slept, as the flashing blue and red emergency vehicle lights lit up downtown after a sniper killed five Dallas law enforcement officers working security at a public protest. Like many horrified Dallas residents that night, she exchanged texts with loved ones and friends, letting them know she was O.K., while watching non-stop TV coverage. When Katy went to work the next day, she realized her company could do more than grieve and sympathize. Premier Transportation went into a non-stop, 24/7 fleet overdrive like nothing it had experienced before, not even the icy snowbound Super Bowl of 2011. The company donated hundreds of hours of trips using most of its 100+ fleet vehicles and 100+ employees for the funerals, family needs, and airport transfers related to all five of the fallen officers. They took relatives, friends, and visitors to and from airports, hotels, viewings and visitations, and numerous local destinations. Premier chauffeurs drove vehicles as part of official police escorts and convoys that traversed a metro area gridlocked by sorrow. The Premier staff maintained its professional demeanor as an entire metro area came together to console one another while the news spread: Former Army veteran Micah Xavier Johnson, 25, outraged about police shootings, ambushed and fired upon a group of police officers, killing five and injuring nine others, and wounding two civilians. Johnson was killed when a police robot detonated a bomb near him following a standoff over several hours. “It is the responsibility, corporately, to assist in times of tragedy," Devlin said. "However, when individuals lead the charge in giving back to the community, mourning with the families, hurting for the police officers, and going above and beyond….that is when I am most proud. It is very easy to write a check to help support such worthy causes and needs, but getting in the trenches and becoming involved is the way you show those affected you care. I have the best staff in the country!" What heartened the Premier staff was the fact so many of its chauffeurs volunteered to work for free during the extended service period. The company, however, insisted on paying them for all hours worked. The fleet logistics, which Clark at times described as crazy, are too numerous to recount. Premier deployed its four motorcoaches, five stretch limousines, Sprinter vans, mini-buses, sedans, SUVs, and even drew upon local affiliates Concierge Limousine and AJL Transportation when it ran out of vehicles. He woke up at 2:30 a.m. on one day to spot the company’s four motorcoaches as they transported 200 police officers from the Dallas Police Department headquarters to Love Field so they could catch flights for the funeral of Officer Michael Krol held in Redford Township, Mich. Southwest Airlines donated tickets for the officers, who returned to Dallas later that afternoon. American Airlines also donated flight transportation to relatives and officers flying in and out of Dallas-Ft. Worth International Airport. While participating in a convoy to and from DART (Dallas Area Rapid Transit), police officer Brent Thompson’s funeral in Corsicana, about 55 miles south of Dallas, Davis observed how police vehicles from towns and cities along the way would seamlessly flow in and peel off from the procession as it moved across each borderline. “It was an experience to see something of this skill and magnitude, and how everyone came together for the same purpose, Davis said. DES PLAINES, ILLINOIS, MAY 10, 2016: (TSX:NFI) (TSX:NFI.DB.U) Motor Coach Industries ("MCI"), a subsidiary of New Flyer Industries Inc. (the "Company"), the largest bus and motor coach manufacturer in North America announced the delivery of five 2016 MCI J4500 coaches to Premier Transportation. The delivery marks Premier's fast-paced foray into the large Dallas-Fort Worth group transportation market. "Conventions, corporate, wedding and sporting events are very big in the Dallas-Ft. Worth area," said Eric Devlin, president and founder of Premier Transportation. "With MCI's luxury-line, high quality J4500 coaches, we are now equipped to meet this growing market demand." According to a 2014 report from Resonance Consultancy Ltd., Dallas is America's third most desirable place to visit, offering attractions like the Dallas Arboretum and Botanical Gardens, Perot Museum of Nature and Science and George W. Bush Presidential Center, along with the Bishop Art District. In fact, the Dallas market has seen a 24 percent rise in convention business in 2015 from 2014 that brought an estimated $900 million in economic impact during 2015. Add professional, collegiate and high school sports to the mix, and group transportation needs are only growing, according to Devlin, who expects his coach business to increase by 30-40 percent in revenues in the next two years. "We see a need for additional capacity in motor coaches for the Dallas area," said Jennifer Watson, Director, Special Events & Industry Relations for Dallas Convention and Visitors Bureau. "With Premier, I know that I have a reliable partner that's professional and provides superior customer service. I know they'll be available at any time." Premier's MCI J4500 coaches arrived in sleek black to match the company's brand of providing comfortable and client-oriented transportation service that is safe and reliable. Two of the five coaches are equipped with a wheelchair lifts and also feature plush leather seating and safety belts for 56 passengers, hardwood floors, individual 110-volt charging stations, eight 15-inch LCD wide-screen HD monitors with satellite DIRECT TV, music connectivity and Wi-Fi capabilities. The coach comes equipped with a Cummins engine for optimal fuel economy and near zero emissions. Another advantage for Premier's operation is its close proximity to the MCI Service Center in Dallas, where MCI has an extensive aftermarket parts warehouse, and MCI-trained technicians on hand to provide maintenance and repairs. Founded in 1996, Premier Transportation has extensive fleet of more than 80 luxury, late model vehicles including limousines, sedans, SUVs, Mercedes Sprinter vans, limo and shuttle buses, and of course, their new coaches. A graduate of Baylor University and a transplant to Texas, Devlin built Premier with just two vehicles and three employees that at the time was "bare bones and all hands on deck," he said. Today, the company provides 24/7 service, 365 days a year with experienced staff and highly professional chauffeurs committed to exceptional customer service. In early 2015, Premier launched its own app for iPhone and Android smartphones, making it convenient for passengers to book reservations, access trip history, and secure real-time updates on chauffeur location. 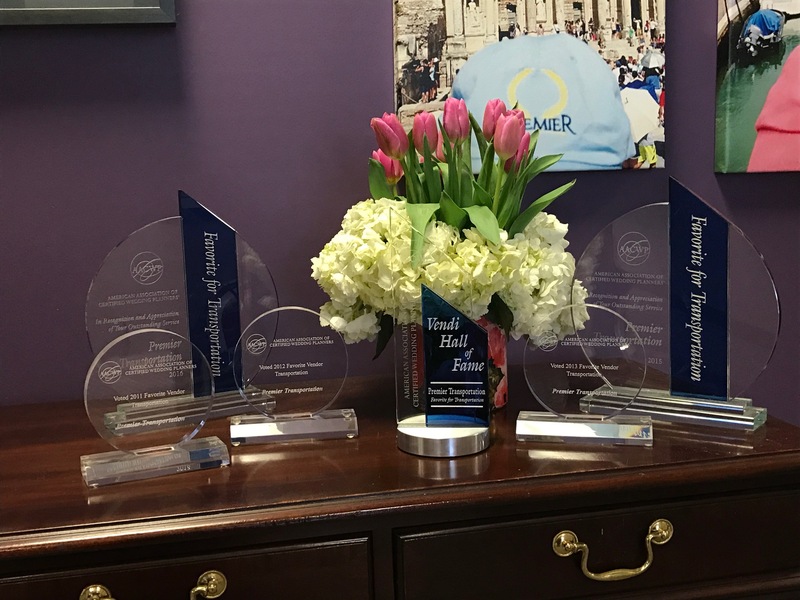 Premier is an award-winning provider taking a National Operator of the Year award for two consecutive years, and recognized as "Favorite Vendor of the Year" by the American Association of Wedding Planners, six years in a row. Devlin is also the NorthStar Award Recipient for Entrepreneurism and Philanthropy from the Entrepreneurs Foundation for North Texas. Premier is proud to announce the launch of the Premier Transportation App for iPhone and Android smartphones. Now you can experience even more convenience and exceptional service through an easy-to-use interface. Just use your phone to interact directly with the Premier Transportation reservation system - everything is at your fingertips! Download the app from Apple iTunes or Google Play. If you already use the Premier online system, just click on the Premier app on your smartphone and enter your user name and password on the home screen. If you are an existing customer but you don't have an online account, or you're a new customer, just call our office at 800-789-4847 or 214-351-7000 to request your user name and password. Once you are logged into the app, click on Preferences and enter your personal profile information. Click on Reservations and follow the prompts to enter your trip details. We already help you arrive in style, and now we’ve made it even easier for you to experience Premier's exceptional service and reliability. Download the Premier Transportation app today! Premier Transportation is proud to be a part of a new book, “Professional Wedding Planning Advice.” The book provides information on various services in the wedding industry, including flowers, catering, venues, and much more. In the Premier section, you can find valuable information on how to select and reserve your wedding transportation – limousines, buses, sedans – whatever you need to make your event perfect. You can purchase the book on Amazon. Plan your Perfect Wedding Transportation.